Marketing fundamentals work for Santa too! “Thanks for making this memorable,” Mike Kappel, sales and marketing director at the Hyatt-Regency smiled. Kappel left a meeting to meet Santa who showed up unannounced with a gift. The gift was a Christmas card holder purchased for 60 cents at a discount store. I’m sure Mr. Kappel receives tons of fancy gifts from vendors plying their wares during the holiday season. But that gift from a Santa on a crisp November afternoon made his day. I accompanied Santa aka Steve Dailey on a marketing blitz at shopping centers, major stores and select hotels to help promote his business. Steve asked for my advice on creating buzz for his Santa business. I suggested a 3-prong strategy incorporating guerrilla marketing, social media and public relations. That 3-prong approach are the lessons Santa taught me, a marketing pro, about memorable marketing. #1 Bring a gift. Our guerilla marketing campaign was a one-day blitz of cold-calls on marketing and promotion directors at several major shopping centers, select retail outlets and hotels. I knew these are very busy professionals who are inundated with vendors. I wanted to create a 30-second visit that would make Santa stand out from the typical cold call salesperson. The gift and Santa in his suit instantly endeared him. Only 1 person didn’t see us in person because he had already booked a Santa. But everyone else gave us time to make our pitch. The result of that blitz was a booking with a major themed-hotel. #2 Create an online persona. 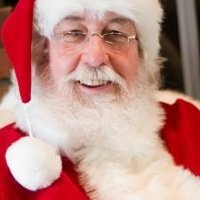 I launched a fan page for Santa on Facebook and didn’t realize at the time that Steve was the only Santa with a fan page. In 6 weeks during the holiday season, the fan base grew to almost 10,000 fans from all over the world. Steve has a folksy personality and he’s a good writer to begin with. I posted his updates the first week until he took over with his statuses about the reindeer, North Pole life and much, much more. He took gift requests, launched a toy drive and brought joy to his fans with updates about preparing for Christmas. #3 Don’t forget traditional public relations tactics. I sent out a news release to Kansas City media announcing Santa’s fan page. I also connected Santa to City Union Mission, a faith-based organization that serves the poor and homeless in Kansas City. We created a drive called Operation Santa, collecting toys for children and teenagers. That required another news update. Santa’s activities online and offline garnered front page stories in the Lee Summit Tribune and Lee Summit Journal, 2 Fox 4 news stories and a Kansas City Star news story. The guerrilla cold-call blitz, online marketing and traditional public relations tactics created an effective mix for Santa’s campaign. The white-beareded, red-suited character is alive and well in the hearts of everyone. Steve enjoyed keeping the imagination alive in fans from 70 countries and all over the U.S. Next holiday season, Santa may appear on Good Morning America.